The below artworks are the most important in Photojournalism - that both overview the major ideas of the movement, and highlight the greatest achievements by each artist in Photojournalism. Don't forget to visit the artist overview pages of the artists that interest you. 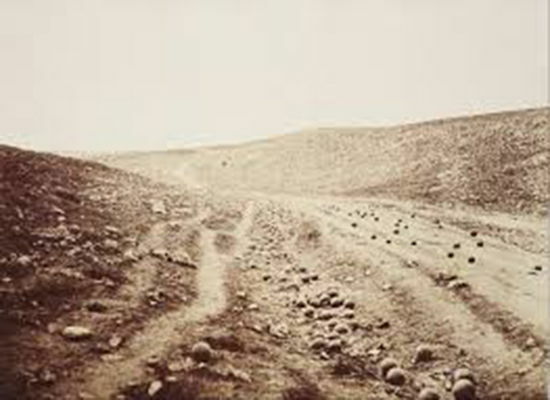 Artwork description & Analysis: Fenton's image, which depicts a ravine in a desolate landscape beneath a bleak empty sky, is populated only with cannonballs. Strewn along the road on the right, and filling the ditch between the road and two paths on the left, the cannonballs are meant to represent British casualties of the Crimean war. The perspective of the photograph, looking up toward the sloping hills and around the incline of the road, captures something of the sense of hopelessness at being trapped in a valley under enemy fire from above. As Fenton described it: "the sight passed all imagination: round shot and shell lay like a stream at the bottom of the hollow all the way down, you could not walk without treading upon them." 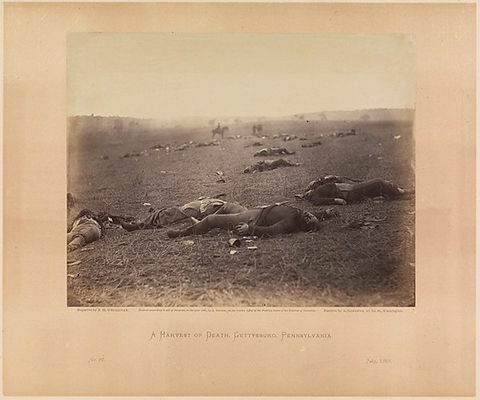 Artwork description & Analysis: This image, possibly the best known of Brady's Civil War photographs, depicts dead soldiers scattered on the battlefield after the Battle of Gettysburg, which took place between July 1-3, 1863. The photograph was included in Alexander Gardner's, Photographic Sketch Book of the War (1866), with text that read: "it was, indeed, a 'harvest of death' that was presented; hundreds and thousands of torn Union and rebel soldiers - although many of the former were already interred - strewed the now quiet fighting ground." The image was preceded by Gardner's hope that "Such a picture conveys a useful moral: It shows the blank horror and reality of war, in opposition to its pageantry. Here are the dreadful details! Let them aid in preventing such another calamity." During the Civil War, though photographs were taken of the dead, sometimes even in the stages of decomposition, newspapers and journals refused to publish them. It was only in books like Gardner's that the images were available to the public. Viewers, used to heroic depictions of war presented in paintings, were shocked by images like this one. The collected works showed the power of photography to depict history in the making. As The New York Times said of the book, "The faithful camera [...] has written the true history of the war." Artwork description & Analysis: This picture depicts a destitute middle-aged woman holding a sleeping child on her lap, as she rests on a doorstep. The Crawlers was intended to communicate the dire situation of London's poor and to advocate a call for social change. 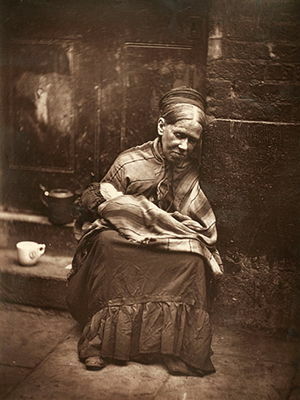 The image was one of 36 published in Street Life in London (1877) with the writer Adolphe Smith Headingly's text relating the story of how the woman, through circumstances beyond her control, "descended penniless into the street." Using photographs to uphold the arguments presented by the text, the book helped pioneer the concept of the photo-essay. Thomson and Smith were both social reformers and hoped that their work would convince their readers that homelessness was "often, the result of unfortunate circumstances and accident." The image conveys the woman's exhaustion and also her solicitude for the child. In their introduction to the book, the co-authors championed "the precision of photography" and its ability to "present true types of the London poor and [to] shield us [the authors] from accusations of either underrating or exaggerating individual peculiarities of appearance." 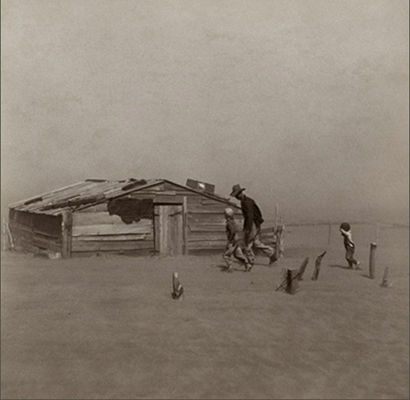 Artwork description & Analysis: This iconic image depicts Arthur Cobel, a farmer and his two sons walking toward their simple shack in a dust storm on the Southern Plains of Oklahoma. The dust is so dense that the horizon is a blur, and the accumulated sand has built up in drifts so that the fence posts are now shorter than the young boy who runs along behind (with his hands protecting his face from the dust). Rothstein said of this photograph, "It was a picture that had a very simple kind of composition, but [...] it showed an individual in relation to his environment." Arthur Rothstein was the first photographer appointed by the Farm Security Administration (FSA), a project that was meant to build support for the social reforms of the Roosevelt Administration. Here he documents the devastating effects of the Dust Bowl of the 1930s, a phenomenon caused by a combination of a severe drought and over farming, that lasted eight years and devastated livestock and crops. Rothstein's career extended over some five decades. Working for Look magazine first as a photographer, and subsequently as its director of photography, in later years he became a respected teacher who schooled the renowned filmmaker Stanley Kubrick. Artwork description & Analysis: As its original title confirms, Capa's most iconic image captures the "moment of death." 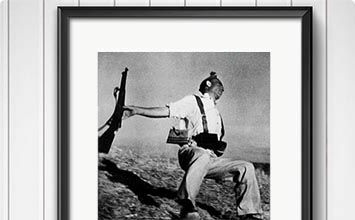 The falling soldier is a loyalist militiaman fighting the Spanish Civil War and he has been struck in the forehead by a bullet; he falls backwards as his own rifle slips from his hand. Prior to Capa's photograph, war photography had often depicted stationary scenes of armaments, encampments, or the aftermath of battles. Shockingly brutal in its depiction of the realities of war, The Falling Soldier (originally titled: Loyalist Militiaman at the Moment of Death, Cerro Muriano, September 5, 1936) earned Capa the accolade "the greatest war photographer in the world" and duly set a new standard for authentic war photography. As Photojournalism emphasizes the accurate depiction of newsworthy events, questions of authenticity (more so than artistic merit) are of crucial importance. Thus, a hint of controversy developed around the identity of the soldier, the precise location of the photograph, and the circumstances under which it was taken. It wasn't until the 1990s that the man's identity was confirmed by his surviving brother, and military accounts recording the event of the man's death confirmed the picture's authenticity. However, other controversies persist around the potentially disconcerting effects of the photojournalistic image itself and how it impacts on the lives of the people it directly affects. These were not issues that concerned Cartier-Bresson who viewed Capa, with whom he later cofounded the Magnum agency in 1947, as a mentor and a voice of conscience. Artwork description & Analysis: Bourke-White began her career in the early 1930s, and in 1937 when the Ohio River flooded Louisville Kentucky, she was sent to the area as a staff photographer for LIFE magazine. Documenting what was one of the largest natural disasters in the history of the United States, Bourke-White's images offered a commentary on racial and economic inequity. This photograph depicts African-Americans queuing outside a flood relief agency in front of a billboard that depicts a cheerful white middle-class family in their car. The billboard's heading "World's Highest Standard of Living," and the slogan "There's no way like the American Way," can be treated with ironic scepticism given the reality that is playing out in front of the billboard. Artwork description & Analysis: This photograph captures a single instance of the D-Day invasion as Allied forces came ashore during the Normandy beach landing. The image focuses on a single soldier, who lies prone in the water as he looks towards shore, his gun extended in front of him. In the background, troop carriers can be seen, and objects - perhaps dead soldiers - float in the water. The blurriness of the photo, due to the photographer's position in the water, and the terror of being under artillery fire himself, conveys the utter chaos of the scene. Capa took over a hundred photos of the D-Day invasion, but a processing accident at LIFE magazine's London darkroom destroyed all but eleven of them. Dubbed the Magnificent Eleven, the images inspired Steven Spielberg's 1998 movie Saving Private Ryan. The film represented the Omaha Beach assault through a 27 minute opening sequence that many critics consider to be the most realistic depiction of battle ever produced. Capa was the foremost war photographer of his generation, and perhaps, of the entire 20th century. His work exemplified the exacting standards expected of photojournalists and this was acknowledged by the Overseas Press Club of America who awarded the annual Robert Capa Gold Medal for overseas coverage "requiring courage and enterprise" in his honor from 1955. Capa himself was killed in 1954 while photographing the Indochine War in Vietnam. Artwork description & Analysis: Cartier-Bresson travelled to China in 1948 on an assignment with LIFE magazine. He was tasked with photographing the transition from the Kuomintang government to the People's Republic, led by the Communist chairman Mao. In this claustrophobic and turbulent scene a group of Chinese people tries to form a line outside of a bank (just outside of the picture's frame on the right). Some huddle or cling for physical stability to the people around them while others jostle forward. Others are seen climbing the building behind the crowd mass. Tightly framed, the image conveys a sense of panic and desperation. The cause of the crush was a currency crash that rendered paper money worthless and the ruling Kuomintang government promised to give forty grams of gold to each effected citizen. Cartier-Bresson called it "The Gold Rush" and described how "Outside the banks on the Bund vast queues have formed, spilling over into the neighboring streets and blocking the traffic. About ten people must have died in the crush [...] Some people waited more than 24 hours to try and exchange their banknotes." Artwork description & Analysis: Already well known for his photographs of the Spanish Civil War (where he worked alongside Capa) David "Chim" Seymour was a Polish Jew and the first official UNICEF photographer to document the plight of children who had become refugees or orphans after World War II. This image depicts Terezka, a traumatized girl of seven or eight, who, having grown up in a concentration camp, was moved to a home for mentally disturbed children in Warsaw. Terezka had been asked to draw a picture of "home" and produced a frenzied scribble that was matched by her agitated expression. "Chim's" UNICEF photographs were published in LIFE magazine in 1948 with the caption for this image reading: "Children's wounds are not all outward. Those made in the mind by years of sorrow will take years to heal." "Chim's" friend, and cofounder of Magnum, Henri Cartier-Bresson suggested that "Chim" had "picked up his camera the way a doctor takes his stethoscope out of his bag, applying his diagnosis to the condition of the heart." Cartier-Bresson's assessment might have had special resonance for this image given that "Chim" had learned the details of his own parents' deaths in a Warsaw ghetto while on the UNICEF assignment. This photograph, selected by Edward Steichen for his world famous exhibition The Family of Man in 1955, became one of his best known. "Chim" was killed during a photo assignment while he was covering the armistice of the 1956 Suez War. Gelatin silver print - National Gallery of Art, Washington D.C. Artwork description & Analysis: This photograph depicts Navy chaplain Luis Padilla, himself under threat of sniper fire, holding a wounded man in the street during a Venezuelan revolt. The padre had gone out into the streets to give last rites to the dying man, when the photographer, also under fire, took this shot. The background, depicting a closed up carnicería - which in Spanish translates to "butcher's shop" or "slaughter and carnage"- brings added poignance to the image. one of a series in the city of Puerto Cabello, home of Venezuela's largest naval base. Through the selfless humanitarianism of the solitary padre, the image represents both the best and worst of the human condition and the photograph was named the World Press Photo of the Year in 1962 and won the Pulitzer Prize for Photography a year later. The photograph also influenced Norman Rockwell's Murder in Mississippi (1964). Artwork description & Analysis: To take this image, Koudelka asked an unnamed passer-by to position himself in order to show the exact moment the Soviets invaded Prague in 1968. Koudelka, a theatre photographer, had never photographed news events before, but in the week following the invasion he took over 5000 photographs of the widespread revolt of anti-Soviet activists. He was shot at and pursued by soldiers but managed to arrange for his photographs to be smuggled out to the country and sent to Magnum. The images then appeared in the British Sunday Times and LIFE magazine in America. The published photographs were attributed to someone known only as PP (for "Prague Photographer") in order to avoid personal reprisals. Ultimately, Koudelka left his native country for a life of exile. He became one of the most noted photojournalist of his generation, and published his first book Gypsies in 1975 and Exiles in 1988, both of which reflect on the themes of homelessness, exile, and the life of the outsider. This work, however, exemplified the idea of photojournalist as personal witness and the risks that that might entail. Artwork description & Analysis: Natchwey is one of the best-known contemporary photojournalists and war photographers. He has been awarded the Robert Capa Gold Medal five times, and the World Press Photo Award twice. He has covered armed conflicts since 1981 when he was assigned to Northern Ireland, and has been a contracted photographer with Time since 1984. This image originated in his coverage of the war of Afghanistan in the 1990s and depicts a local woman in mourning. She is shrouded in a burka reaching out to touch the tombstone of her brother's grave in a cemetery in Afghanistan. The horizon is cut off in order to emphasize a desolate landscape littered haphazardly with similar headstones. In his work, Natchwey emphasizes the role of photojournalist as objective witness: "There's a vital story to be told" he said and he has used his camera to tell the story of war, famine, social unrest, the AIDS epidemic in Africa, and the worldwide epidemic of drug resistant tuberculosis. Committed in principle to Capa's famous maxim "If your pictures are not good enough, you are not close enough," Natchwey is noted among photojournalists for the intimacy of his images. In 2001 a documentary film about him, War Photographer, was nominated for an Academy Award as best documentary. Artwork description & Analysis: This photograph shows a young black man running down the middle of the street, while being pursued by dozens of policemen. Having grown up in West Baltimore, Allen was 26 years old when he took this and other images documenting the riots following the death of Freddie Gray while in police custody. The image captures something of the intensity of the hostilities while working also as a commentary on contemporary race relations. Inspired by Gordon Parks and Andy Warhol, Allen had previously explored street photography and portraiture. He posted his images on Instagram where they were shared widely on Twitter and other social media platforms. Finally they featured on CNN and the BBC news channels. Indeed, this image became Time's cover image (on April 25, 2015) and he was only the third amateur photograph to be featured on its cover. The cultural critic John Logan noted that in the age of social media the "documentary images of this civil rights era [had become transformed through] first-person dispatches," though whether that is necessarily a positive step forward for Photojournalism is open to question. Film negative - National Museum of African American History & Culture, Washington D.C.